SIPp is a free test tool and traffic generator for the SIP protocol. It uses XML format files to define test scenarios. Load test scenario from specified file. Use CSV file to insert data substituted for [field0], [field1], etc into XML scenario. First line of file describes order of inserting field sets (SEQUENTIAL/RANDOM/USE). Use one of the embedded, predefined scenarios like "uac", "uas". Scenario execution rate, default value = 10 times per period, default period = 1000 ms. Scenario execution period [ms], combined with execution rate. Execution rate is combined of rate and period parameters, i.e. if period = 3500 and rate = 7 there will be 7 calls in 3.5 s.
Set the transport mode: "u1" - UDP, one socket (default), "un" - UDP, one socket per call, other modes (TCP and with compression) available. Set the limit for simultaneously used sockets (for one socket per call mode). If limit is reached, sockets are reused. Stop and exit after specified tests count. Set user part of the request URI (default: 'service'). Replaces [service] tag in XML scenario file. Set password used for auth challenges (default: 'password'). Limit simultaneous calls (default: 3 * call_duration (s) * rate). Global receive timeout (miliseconds). By default call is aborted, use ontimeout attribute to take other action. Log sent and received SIP messages (file: scenario_pid_messages.log). Log error message to file (like "Discarding message which can't be mapped to a known SIPp call"). Dumps one of the default scenarios. Usage example: sipp -sd uas > uas.xml. These scenario files were tested with sipp-win32-2009-06-06. Send OPTIONS message 5 times to 30@192.168.1.211. Send OPTIONS message 30 times to 30@192.168.1.211 waiting 200 ms for 200/OK reply each time. Register to 192.168.1.106 using parameters from CSV file. If CSV file has more than one entry you can increase simultaneous call limit (-l option). Register to 192.168.1.211 using parameters from CSV file and start dialog-info subscription (RFC4235). SIPp is simulating 3 UACs, each one of them is making outgoing call. This scenario expects calls to be answered. Call targets are 3 other UACs configured to auto answer and play wav file (single pjsua instance with 3 accounts). Each call is disconnected after 30 s. Call limit is this time smaller than number of CSV entries to avoid multiple calls to single target. Some modification may be needed when calling operator that is using more complex proxy infrastructure. 1) Handling SIP/407 after INVITE. 2) Using rrs="true" and [routes] to keep Record-Route header set supplied by the operator. 3) Using [next_url] in ACK and BYE messages. When detecting FAX tone 1st party sends re-INVITE with T38/image offer. Second party rejects offer with 488/Not Acceptable Here but call should not be disconnected. Little tricky scenario that requires two actual scenario files. Sipp is simulating registration and BLF subscription server that immediately terminates subscription with reason=noresource. 1) With tested UAC create registration account 30@your_pc_ip_address, no password. Create dialog-info+xml subscription for 108@your_pc_ip_address. 2) Run UAS REGISTER scenario and wait for the phone to log in. 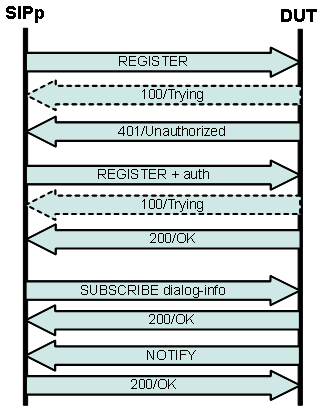 3) Break REGISTER scenario by hitting Ctrl+C and run UAS SUBSCRIBE scenario. DUT is expected to send 200/OK with SDP offer but not changing session parameters. 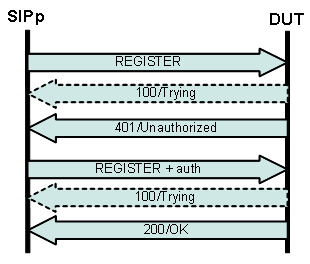 1) SIP registration with authorization. 2) Calling number 110. In my test extension 110 is FXS and is looped back to FXO port and call is answered by DISA. 3) Dialing another 3-digit number using SIP INFO DTMF (Content-Type: application/dtmf-relay in this scenario). Call is not answered. Note: if using "application/dtmf" Content-Type (message body consisting of dtmf only) sign "*" should be encoded as "10" and "#" as "11". if attack is successfull callee is sending BYE again with Authorization: Digest header added. Assuming that username and realm are known attacker can now use brute-force method to guess user password. guessing password through brute-fource would be time consuming or almost impossible for more complex passwords. If you ever had to make high-load call or even single-call tests with G.729(a) codec then you may find out that finding a free softphone with G729a capability is not an easy task. Obviously pjsua would be good choice, but it require downloading DirectX SDK, Intel Performance Primitives package and rebuilding from sources, so it would take few hours to get working binary. Another option is capturing RTP stream using Wireshark and playing it back when generating or receiving calls with SIPp. Here is .pcap file with 2 minutes of G.729 RTP stream. This is actually recorded connection with some voice mail system. Extract this file to \pcap subdirectory of SIPp. Included scenario is UAC call, to get credible load test results you can call i.e. some DISA or auto-attendant lines that will play some announcement back. Simulating UAS that sends re-INVITE with image/t38 after detecting fax tone / preamble on fax reception. Since there is no actual tone/preamble detection script assumes that all calls are fax calls and reinvites all calls after short delay. Note: actual fax transmission would fail after timeout due to no UDPTL endpoint presence. Contains From/To headers content swapping using variables and ereg action. For similar tests: rtp_pcma_fax_cng.pcap - CNG signal recorded from PCMA RTP stream (can be used with scenario similar to uac_pcap_G729.xml to test switching to fax extension on CNG detection). Short announcement, CED signal and modem preable/training sequence as generated by software bundled with PC fax/modem I bought: rtp_pcma_fax_ced_training.pcap. Pjsua sleep command allows to pipe commands from prepared text file to pjsua in a timely manner making it possible to use it as limited but very easy to use call generator. For simple tasks such as sending single SIP message to remote destination sipsak may be handy. Win32 SIPp build with drag-and-drop launcher.